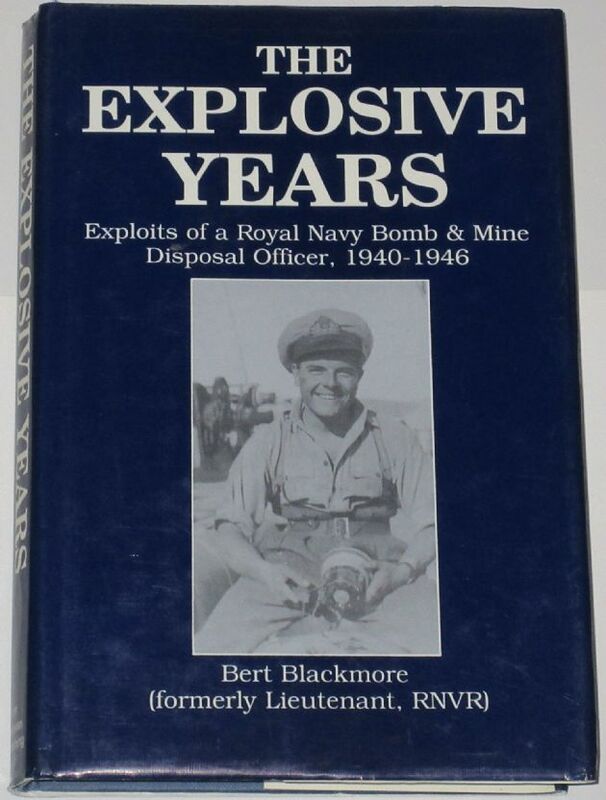 Subtitled 'Exploits of a Royal Navy Bomb and Disposal Officer 1940-1946'. from the front inside fly leaf: In December 1918 Graham Greenwell, the author of the 1935 classic War Letters of a Company Officer 1914-1918, wrote to his mother: "Could you ever have guessed how much I should enjoy the war?" A bold statement, perhaps, but a truthful one which in no way detracted from that writer's sorrow at the death and devastation of the conflict. In The Explosive Years Bert Blackmore looks back at his war in very much the same vein. It was a personal adventure beyond the bounds of peacetime possibility, a personal challenge that threw up opportunities for responsibility, comradeship, travel, danger and excitement. This was true for untold numbers of 'civilians in uniform,' of course, but Bert Blackmore's experiences were different from most, and they make absorbing reading. Bert worked hard to get accepted for the Royal Navy - his family was connected with the sea so it was the only conceivable way of going to war - and this resulted in his call-up in 1940. After training he was posted to a destroyer and served aboard her for nearly a year, including operations in the Atlantic and the Mediterranean, before being selected for a commission. Back in training he was wounded by a bomb during the blitz on Portsmouth, but after what seemed like an interminable delay he was commissioned. This delay was instrumental in Sub Lt. Blackmore's naval career: had he passed out with his colleagues he, like them, would have been appointed to command a landing craft, but by the time he was ready needs had changed, and from a number of specialis­ations on offer he chose Bomb Disposal. This 'private navy' was a highly respected organisation which was responsible for port clearance, naval vessels, beached mines etc., and Bert's service with the Department took him into close contact with numerous types of bombs and mines in the UK and in North Africa, Turkey, Greece (during the Civil War) and South-East Asia, and into contact with a number of characters and some unforgettable experiences. The condition of the book is generally good. The dust jacket has several minor scuffs, and light wear along the edges and corners, but the spine is intact and all pages are clean and bound. The book has spine roll along the left hand edge, and there is a small owners stamp on the first inside page. The binding is beginning to be exposed between pages 284 and 285, but all pages remain firmly bound.